PA system stands for “Public Address” system. Like the name suggests, a PA system is any setup that serves to amplify sound so that it is audible to people. The most basic PA system is the megaphone- a portable, cone-shaped structure that helps to make the speaker’s voice loud. PA systems vary in their complexity- the simpler systems consist of just a microphone and a speaker. The more complex ones have amplifiers, a mixer for live sound, sound processing equipment, along with multiple speakers and microphones. 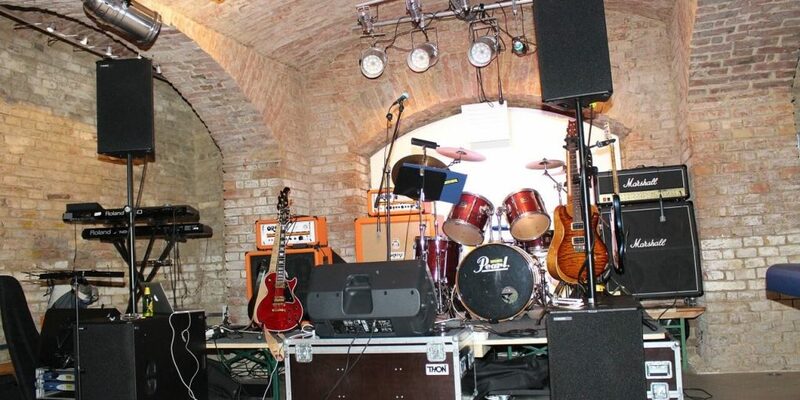 The PA system setup depends on the size and acoustics of the space. PA systems are commonly used in event spaces, clubs, churches, and especially during concerts. The price range for these setups varies drastically depending on the complexity of the system. It could be a few hundred dollars for a small band performance or thousands of dollars for a concert stage set up. PA sound systems have three major components: pickup devices as well as amplifiers, and loudspeakers. The pickup device (microphone) converts sound waves into electronic signals. The amplifier boosts the pickup device’s signal to a higher level and forwards it to the loudspeaker. Finally, the amplifier’s electrical signal is converted into a sound wave by the loudspeaker. Event size: The larger the audience, the more power is required for the PA system. The environment also determines how much power is required- an auditorium requires more wattage compared to a small room. Depending on these two factors, you can shop for a system based on its wattage. To be on the safer side, it’s generally advised that you take a system that’s bigger than what you need. Usage of the system: The PA system you require depends on what you want to amplify- speech or music? Since music employs a wider frequency of sounds as compared to speech, it requires more power. Expansion of the system: It’s best to purchase a PA system that can be used for multiple purposes, instead of buying different systems later. There are many elements that can be added eventually to expand a PA system, like microphones, as well as speakers and cables. It’s best to get a system with multiple input and output jacks as this supports further expansion. The PA speaker placement is of paramount importance. Although some venues are designed keeping in mind the acoustic factors, most rooms aren’t built that way. For bands and other performers, how the speakers are placed in such rooms can be the deciding factor between a terrific or terrible performance. Even coverage: The speakers should be placed and angled strategically to ensure that all the audience members are able to hear the output clearly. This varies from place to place, depending on the seating layout and space. Generally, it’s best to place a loudspeaker at a good height as this sends the sound to the back. Direction and reflection: The speakers should be aimed in the right direction for the audience to receive optimal output. If there’s too much reflection of sound, then the sound can become unintelligible. In order to prevent this, the speakers shouldn’t be kept too close to reflecting surfaces, like walls. Avoid feedback: Feedback is the high-pitched screech that you sometimes hear from speakers. This happens when the amplified sound from a speaker re-enters an open microphone. Imagine the diagram of a loop. Feedback is dangerous and can damage the equipment. This can be prevented by ensuring that the microphones are kept away from direct and reflected sounds. Sound pressure refers to the pressure variations in the air caused due to sound waves. The sound pressure level is expressed in decibel (dB) to convey the loudness of a sound. The lowest sound pressure level is 0 dB and the upper range of the sound pressure level that is bearable for humans is 120 dB. Anything above 100 dB is damaging for the ears. Therefore, it would be sensible to keep the PA system’s sound pressure levels below this. To ensure that sound levels do not have to be pushed to the upper extremes, multiple speakers need to be installed at key positions so that the sound pressure level is even and comfortable for everyone. Depending on the purpose of the event, one will have to pick a PA system that’s capable of delivering the necessary sound pressure levels. Speaker sensitivity determines how much the sound output from the speaker is for one watt of power input from the amplifier. In other words, speaker sensitivity tells us how much power is required to operate a loudspeaker. The better this ratio is, the more efficient the speaker is and the lesser power it consumes. If a speaker has a sensitivity of 84 dB, then this means it would require one watt of power to deliver that. But if it’s increased to 87 dB, then it would require two watts of power because every additional 3 dB of volume consumes twice the power. A speaker sensitivity of 88 dB is considered average. A sensitivity of 92 dB or higher is really good. The fundamental difference between an active PA speaker and a passive PA speaker is that the former powers itself while the latter requires external power. Active speakers are easy to set up and use, whereas passive speakers require additional components. Depending on your need, you can choose one or the other. Since active speakers have built-in power, all they require is a plug point for setting up. Along with built-in power, these speakers also have other controls like EQ, volume, et cetera, making it easier to use. Powered PA speakers can be used for small-scale purposes, like schools and churches or dance and fitness classes. These are great entry level-options for beginners, especially because they are more affordable. Here are some good options if you’re going to buy one right now: cloodjo.com. Passive speakers have no internal amplifier and need power from an external source. However, this makes them lighter and having one of these gives you the flexibility to expand your PA system. If the size of your venue increases, you just need to hook up a few more passive speakers. Most medium and large-size spaces have passive PA speakers installed. A power amplifier is a device that powers the speakers in a PA system. It takes the input-an electronic audio signal, from a microphone or electric guitar- and amplifies it to a level that can power a speaker- the output. While active PA speakers carry an in-built power amplifier, passive PA speakers depend on an external power amplifier. To maintain safety, ensure that the speakers match the power amplifier in terms of the wattage (power rating) as well as the ohms (impedance). This will also make the system sound good. Generally, an amplifier should have twice the power rating of the speaker. For instance, it’d be good to have an amplifier that can produce 600 watts at 8-ohms to match an 8-ohm speaker with a power rating of 300 watts. For music performances, dynamic microphones are a good option. These are sturdy and don’t get damaged due to high sound pressure levels- like those delivered by drums. They are budget-friendly and they provide high-quality sound. Setting up the microphones is simple. The microphones, along with their stands, need to be placed at the positions at which the respective sounds will be input, whether it is the vocals or instruments. For the drums, microphones would have to be set up at each part of the set, like the kick, hi-hat, overhead, et cetera. The microphones should be set at a safe distance so that the drummer doesn’t hit them. Place all the equipment in the right positions. Set the main speakers on both sides of the band and make sure the speakers are facing the crowd. A monitor speaker should be in the middle of the setup and it should face the band. Another monitor speaker can be placed behind the drummer. The mixer can be placed behind the audience. Set the microphones in the necessary positions- for the vocalists and all the instrumentalists. All microphones and instruments should be connected to the stage box. A stage box works as an extension of the equipment cables. It helps in keeping all cables plugged in at a single location. Ensure to split all signals. Send matching copies to the front monitor. Every signal should be processed in the mixing console and sent out from there. AII the output signals need to be processed using an equalizer. AII the signals should be sent to the right amplifiers once distributed. Make sure each power amplifier is connected to the right speaker. Though it can be a cumbersome process to select and put together a PA system, doing it well can produce magnificent results. Otherwise, even the best of performances can sound like a cacophony to the ears. Make sure to use and handle the PA system with utmost care so that it’s efficiency and life doesn’t reduce.